We're living in times where the need of a global awareness regarding extreme poverty could play a crucial role in changing things. 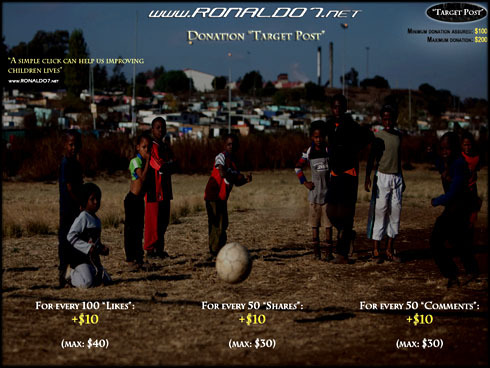 Ronaldo7.net will make a Christmas donation to ONEXONE, a non-profit company that aims at improving the lives of children from all around the World. :: For every 100 "Likes" the "Target Post" receives, $10 will be added to the initial and base amount of $100. A maximum cap is set at 400 likes ($10*4=$40). :: For every 50 "shares" the "Target Post" receives, $10 will be added to the initial and base amounf of $100. A maximum cap is set at 150 shares ($10*3=$30). :: For every 50 "comments" the "Target Post" receives, $10 will be added to the initial amount of $100. A maximum cap is set at 150 comments ($10*3=$30). This basically means that depending on how much people will help/interact with simple clicks, shares and comments on Facebook, the donation amount can raise and double from $100 to $200 (best possible scenario, on which the "Target Post" gets at least 400 likes, 150 shares and 150 comments). The more "viral" the "Target Post" and this initiative gets, the more people can actually be heartened and encouraged to join this noble cause. The "Target Post" will be published/posted this Thursday afternoon (22-12-2011) and the campaign will last until the 24-12-2011 (GMT/UTC+0). For those who are also interested in making a donation to ONEXONE, you may do it through this page: http://www.onexone.org/donate-now.php. Minimum amount for donation is $1 and payment models allow VISA, MasterCard and American Express.